Are you worrying that your Rottweiler looks a little plumper than he should? Perhaps he seems to have a bit of excess energy left over after your daily walk together? Well do not fret, because with our help you can easily keep your Rottweiler’s weight under control. Read on for some great tips on inventive Rottweiler exercise to keep him trim and healthy. Every dog will need a daily run, remember the Rotty is a working dog by nature and genetic influence. So a walk is necessary every day however you can also add some of the following activities into your routine, to make certain that your Rottweiler is tired by bedtime. Here are some ideas of easy exercises that are highly effective in keeping your Rottweiler active and healthy. These exercises will be fun for the both of you. Try getting a laser pointer! Rottweiler’s love to chase things, and the laser pointer will keep them busy as well as entertaining you at the same time! 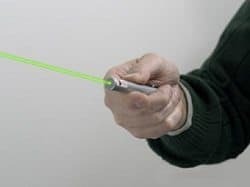 If you have never seen a dog go after a laser pointer, then you are in for a treat! Be careful that your dog does not become obsessed with this activity though because it can cause behavior problems if used too often. Hide a treat or toy somewhere in the home and encourage your dog to work out where it is. 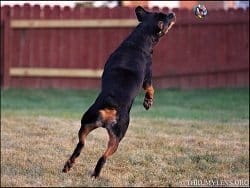 Search games a great fun for you, and your Rotty, but you must build him up to finding the treat, you can do this by teaching him how to fetch first. Take an empty bottle (could be a one, two, or three liter bottle) and fill it with water. Place it in your freezer. 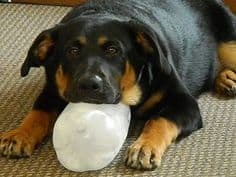 When you are ready to exercise your Rottweiler, take them outside and toss the frozen bottle for them. This is a great summertime play toy for your dog. It’s cold, it’s wet, it’s big, it’s hard to grasp with their jaws…this will keep them entertained as well as hydrated on those hot summer afternoons. If you want to exercise with your dog, there are many things you can do to keep in shape right along with your Rottweiler. There are many activities you can do together that will benefit the both of you. This is an activity you can do in your home, out in your yard, or in the park. You can use a ball, a rope toy, a stuffed toy, a frisbee, or simply a stick. This can keep you both active and entertained. It is also a great way to train your dog to come back to you and release the object so you can throw it again, so not only is this a great exercise, but it is also a training tool as well. Get your Rottweiler’s collar and leash on and head outdoors! You can take a walk around the block, you can take them to the park, you can take them hiking, or maybe you can walk them to your local school yard! This also will help socialize your dog. You can do this indoors as well as outdoors. If you are playing indoors, you can set use your furniture to make a course for your dog. Maybe use your couch cushions for them to use a tunnel to run through. If you have a small footstool, you can use it as an object to jump over. You can also set up objects for them to weave in and out of. If you are outdoors, you can use objects you find in your yard for them to jump over, weave in and out of, and climb up and down from. You can put your Rottweiler’s collar and leash on them and run along beside them and direct them through the course you set up. This will keep you both occupied and exercised. It will also require your dog to use it’s brain to figure out what they are supposed to do. A fun game for you and your dog can be tug of war. I find rope toys to be the best toy to use when playing this game. It’s a game you can play indoors or outdoors. Simply grab a hold and don’t let go! But use caution! 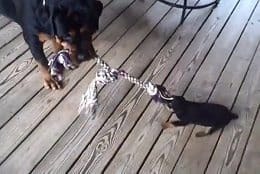 Rottweiler’s sometimes don’t know their own strength and could pull you to the ground or potentially bite your hand while they are trying to grab the other end of the toy. Just be aware. Invite some friends to bring their dog’s along for some playtime! You can all gather at one of your yards or the park. Then let the dogs run and play! You can all run and have fun together while teaching them important social skills. This is also a great time for you to catch up with your friends! It is vital that you know how to read your Rottweilers body language and calming signals when you are introducing him to other dogs, otherwise he could be stressed, unhappy or even starting to become aggressive without you even knowing. 9. May I Have This Dance? This may sound silly, but try dancing with your dog. Lift their big paws onto your shoulders or arms and bounce around to your favorite tunes! Your Rottweiler will get so much pleasure out of this intimate playtime. It is not too often that we allow our dogs to stand up with their paws on us, so this will be like an extra special treat for them, and they will appreciate the kind gesture probably even more than you can possibly imagine. Every Rottweiler needs playtime and exercise to stay healthy, strong, and in shape. So if you aren’t doing anything at the moment, how about tossing your dog their toy, or taking them for a walk. It will certainly keep the both of you happy and healthy.